It’s been a whirlwind few weeks to be a Winterhawks fan. An eight-game winning streak reached its peak this last weekend with a monstrous win over the Everett Silvertips, the stiffest competition in the division. While that was a coup for Portland, the real story has become the sensational ongoing performance of Oliver Bjorkstrand. After representing Denmark in the World Junior Championship, Bjorkstrand amassed 30 points in his twelve games in January for the Hawks, including a career high of 6 points in a single game. This is the first time in two years that a Portland player has accomplished this feat, and the last time it occurred was off an 8-3 win against Spokane. Four of those goals in that game belonged to…you guessed it, Oliver Bjorkstrand. This game, along with a staggering plus/minus of 34 and two hat-tricks in a matter of seven days, was enough to impress the league. The 19-year-old forward was named the WHL Player of the Week, and then in short order was awarded CHL Player of the Week and WHL Player of the Month for January. Bjorkstrand grew up playing hockey in Herning, Denmark and was Portland’s first round pick in the 2012 CHL Import Draft (26th overall). As a member of the WHL Championship team that year, he maintained a one-point-per-game average as a rookie and established himself as a top prospect for the NHL with a reputation for aggressive shots on goal and an aptitude for the forecheck. During his three seasons in Portland, Bjorkstrand has racked up 242 points so far in a matter of 174 regular season games, earned an Assistant Captain patch, and is on track to join the franchise all-time Top 10 in points, goals, and assists. This may be a bittersweet tally, however. Bjorkstrand signed a three-year contract with the Columbus Blue Jackets in 2013 after they picked him in the third round of the NHL Draft. After a fantastic performance this year, it’s likely that the organization may keep him on their roster for the 2015-16 season. Although he would still be eligible for the WHL next year (with him turning 20 this April), his scoring ability would be much appreciated for the Ohio team and their troubled offensive lines. 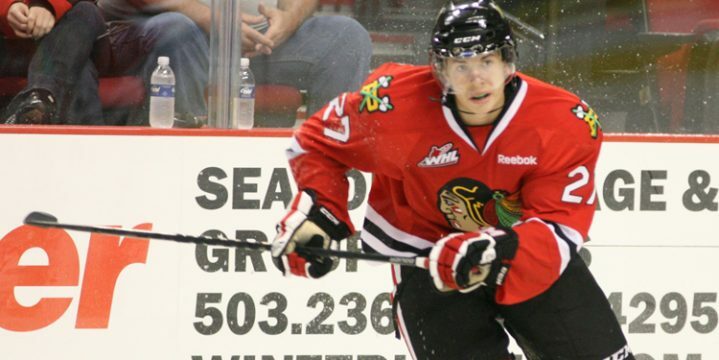 Until then, the Winterhawks will be lucky to have a playmaker of his caliber. Combined with the unselfish setups of Nic Petan and the reliability of Paul Bittner’s stick work, the first line is absolutely on fire. Hopefully their focus can be shared along with the other able-bodied forwards along for the ride. It would be exciting to see Petan paired with Miles Koules and Bjorkstrand with rookie Skylar McKenzie down the line, but ultimately nothing needs fixing on the offensive side of the roster this week. In addition to being a hockey nerd, Kyle is also is an on-camera personality for www.escapistmagazine.com and maintains various podcasts and webcomics revolving around movies, video games, and comics at his personal site, www.chaingangmedia.com.